← Pistachios — not just for snacks anymore? In case it hasn’t been obvious from my postings, I’m quite the omelet fan. Admittedly, I’ve not had the most success in making an omelet from scratch (that is, using eggs instead of that egg mixture in a carton stuff) that hasn’t fallen apart on me once I tried to flip it… until recently. I finally figured it out! So I thought I’d run you through a quick walkthrough (true to my gamer nature, yeah) on how to make an omelet from scratch that doesn’t fall apart on you! First and foremost, my recommendation is not to use too large of a pan. I made that mistake today and the omelet did tear upon flipping, but that wasn’t due to any consistency issues with the egg mixture — the spatula really wasn’t able to handle flipping over such a large expanse of egg. I would use a regular pan next time (it’s just that all of mine were in the dishwater!). 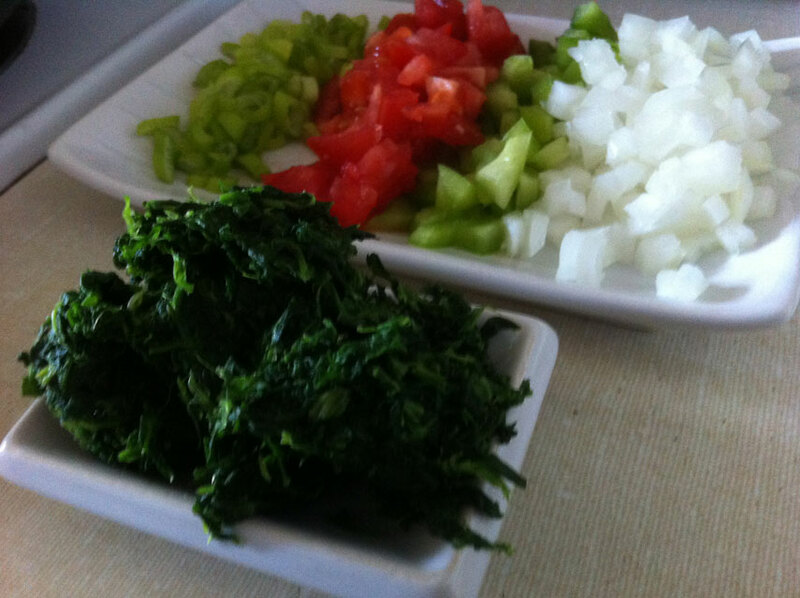 (Back plate, l-r) Green onion, tomato, green pepper and vidalla onion. (Front plate) Half a box of frozen spinach, thawed & drained well. I can’t stress this enough: heat and timing are everything, so prep as much as you can beforehand. Chop what needs to be chopped. Dice what needs to be diced. Grate whatever needs to be grated. 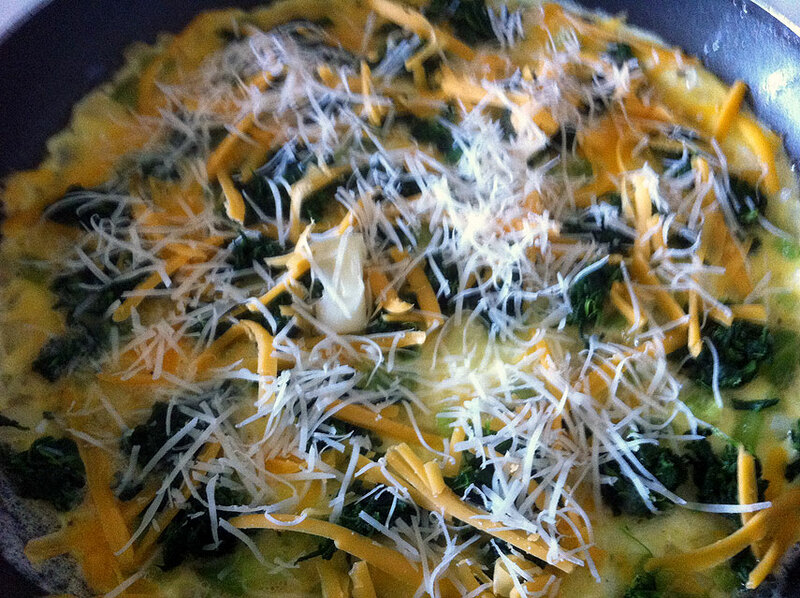 My omelet flavour today was spinach and tomato, so I pre-chopped everything, as you can see. 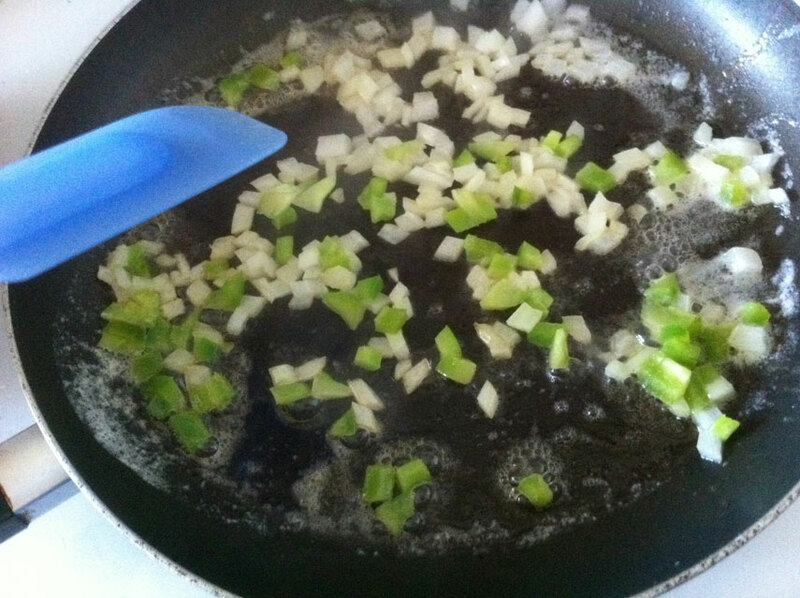 My ingredients: onions, green pepper, tomato and green onions. All of these were set out on a dish in order of adding it to the omelet (okay, maybe I’m a bit to OCD with this, but hey, it made life easier!). 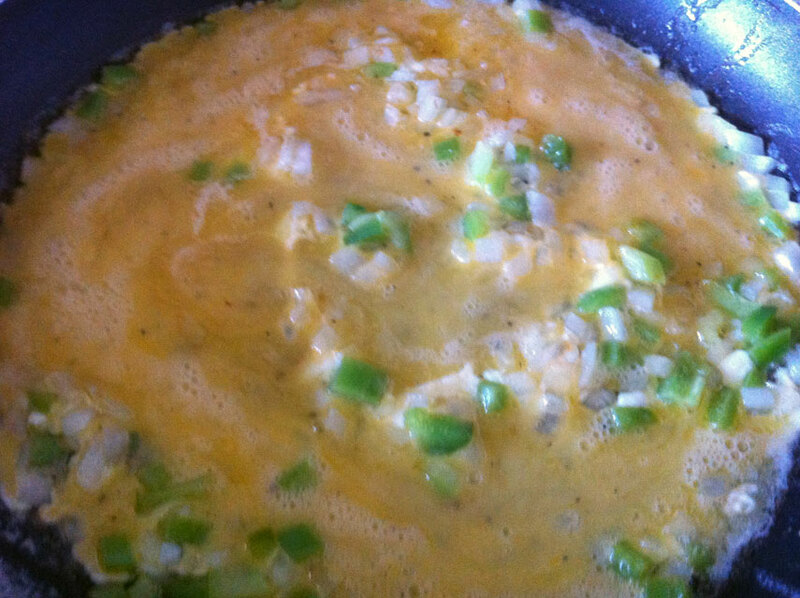 A mixture of 3 eggs, 3 tsp skim milk, salt, pepper, onion salt & garlic powder, beaten well. I also had measured out my frozen spinach (thawed overnight) — also pictured here. What you don’t see is the shredded cheese (sorry) — I used cheddar and asiago, as they’re both sharper cheeses which will stand up to the other flavours. I also prepped my egg mixture: 3 eggs, 3 tsp of skim milk, some freshly cracked black pepper, a pinch of kosher salt, and a pinch or two each of garlic powder and onion salt. The issue I was having with the omelet breaking up too easily was due to adding too much milk. I’ve read on a few websites and blogs that milk has no place in an omelet and should be reserved for scrambled eggs. This camp seems to prefer using just eggs, or adding water as needed. I actually found that milk is a nice touch but the key is to only add 1 tsp of milk per egg. Anything more than that and it’s going to break up easily on you. 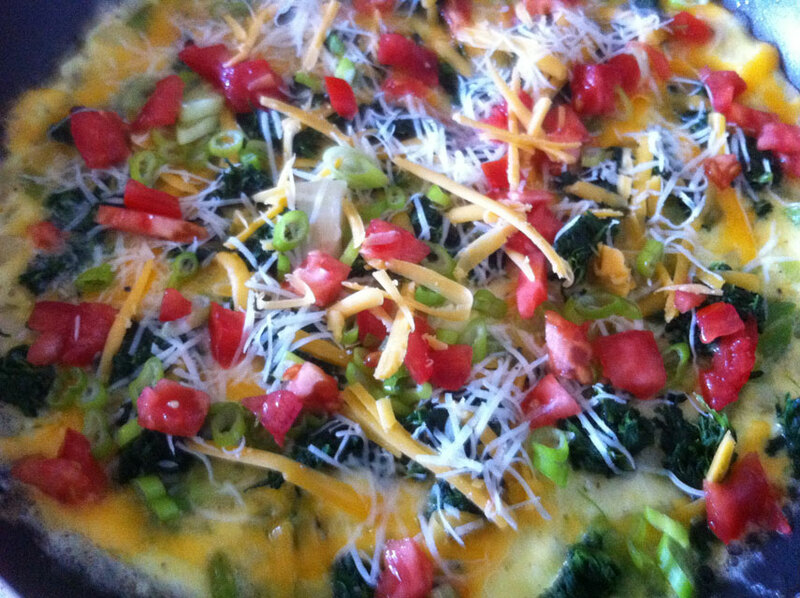 In all of my experimenting, I have tried to use margarine, non-stick cooking spray and butter for cooking my omelets. All of the above will work and I’d suggest you try a couple out until you find one that works for you. But lately, I’ve been using butter and have gotten positive results. I often feel like the non-stick spray gives my food a bit of a funny taste to it — almost a metallic taste. So I tend to use something that adds to the flavour, such as better. The butter was heated in the pan on medium heat, then the onions and green peppers were added just as the butter was beginning to bubble and turn juuuuust a little bit brown on the edges. Brown butter adds a nice flavour but you need to add something to it to stop the cooking process or you will end up with black butter — which just doesn’t taste too good!! The egg mixture joins the party! These were only given a few minutes until I could just start to see the onions beginning to caramelize (that is, getting a slight tinge of brown on the edges) and the green pepper was just becoming tender. The egg mixture joined the pan at this point and was cooked for a few minutes. Sadly, I don’t have the method for cooking the omelet at this point in picture form. I couldn’t manipulate the spatula and the pan’s handle simultaneously. However, if you pop by The Petite Kitchen and look at their Veggie Omelette recipe, it shows how to get the egg to cook properly. 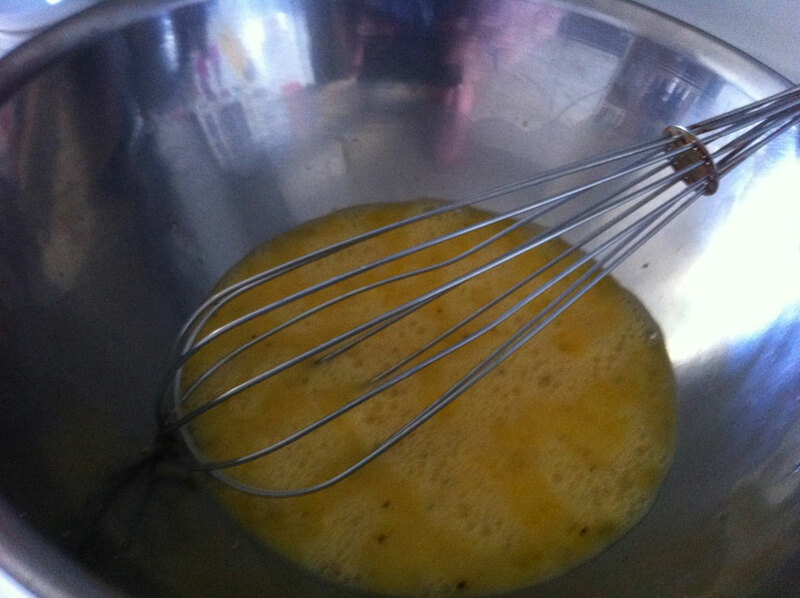 Just slide the spatula gently between the egg and pan and lift ever so gently. Then tilt the pan to allow some of the uncooked egg drain beneath this lifted section. Repeat around the pan a few times in different spots until it no longer wants to drain. The egg might still appear runny at this point but has firmed up enough to no longer move. This is when I generally stop that process and start adding the filling. The first thing I added at this point was the spinach, to allow it enough time to warm back up since it had come right out of the fridge and I prefer my spinach rather warmed through (I’m not a fan of raw spinach). But considering the egg mixture was almost fully cooked by this point, I didn’t let it sit there alone for more than about 30 seconds before adding about half of my grated cheese, then the tomatoes and green onions. The colours really looked amazing in the pan. I almost didn’t want to fold it over and close it up because of this. Once the tomatoes joined the mix, I really loved the interplay of all the colours — it reminded me of an artist’s palette! Sorry… I’m getting all emotional and artsy about my food. I can’t help it! Everyone in the pool now! 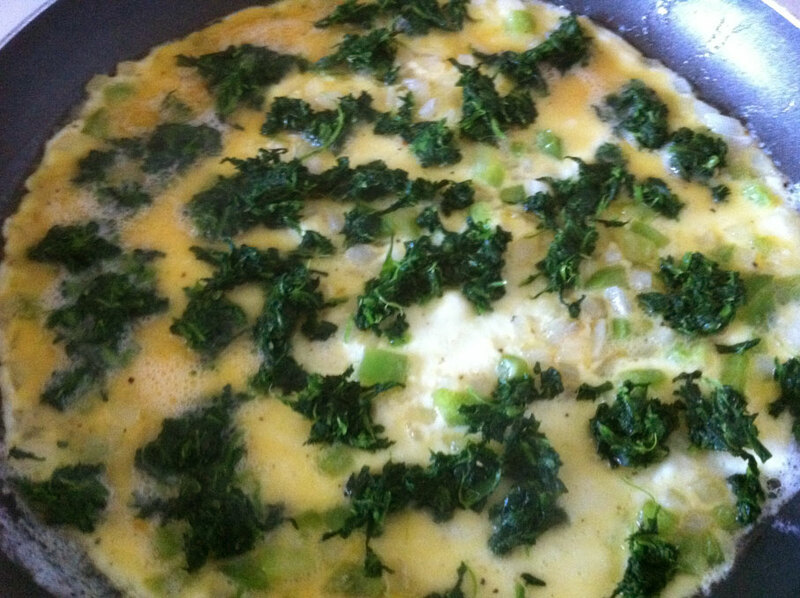 I only let this heat up for a few moments before I attempted the fold-over on this omelet. The rest of my shredded cheese topped it and the entire thing was slid onto a plate. It was darned tasty, if I do say so myself. I thoroughly enjoyed this and look forward to having it for breakfast/lunch again tomorrow (as I need to use up that spinach and the last of the tomato I chopped up). 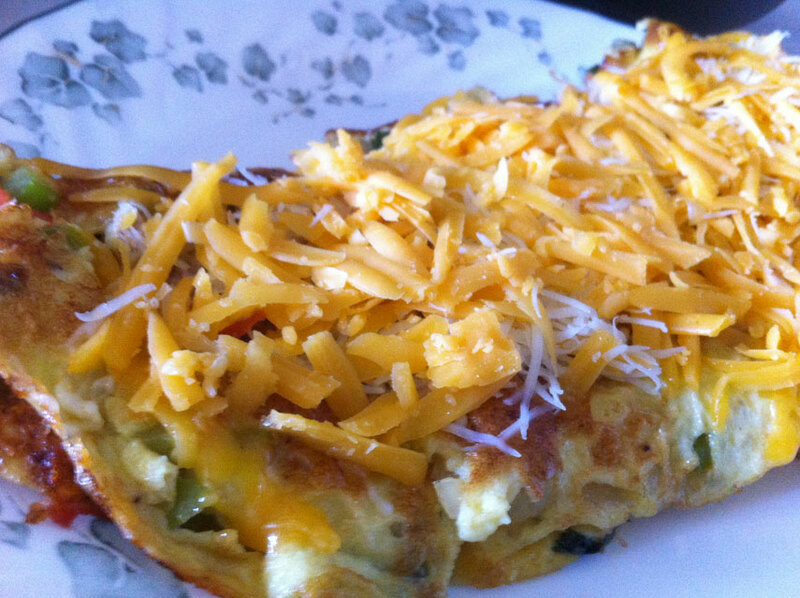 This entry was posted in Breakfast, Brunch, experiments, Lunch, recipe and tagged asiago cheese, cheddar cheese, cheese, eggs, green onions, green pepper, omlet, onion, spinach, tomato. Bookmark the permalink.